Job listings are now updated automatically. Newest postings are listed at the top. Members of the AGM may now submit employment and related announcements for this section online. Please log in to the Members Only area to submit listings. Employers: Please remember to contact AGM if a position is filled before its automatic expiration date so that we can keep job listings as current as possible. Butterfield Country Club, an exclusive Top 100 Platinum Country Club in Oak Brook, IL with a 27-hole championship course is seeking a merchandiser. The individual will be responsible for maintaining the Golf Shop and merchandise in a way that satisfies the individual needs of the members by providing an extensive array of merchandise. It is expected that the Merchandiser will set the standard for customer service and quality, participates as a team member of the Golf Staff with regards to member service and hour coverage above and beyond the essential duties and responsibilities of the position. Responsible for maintaining appropriate merchandise levels in the Golf Shop and Tennis Shop. Responsible for training and education assistant professionals and shop attendants on all facets of merchandising. Formulates a buying plan in order to provide a high-end and sophisticated buying experience for the members. Maintains a written buying plan according to established yearly sales plan that is submitted and approved on an annual basis. Determined direction of soft goods and hard goods retail sales. Seeks out high-end, quality vendors to buy from for the Butterfield Country Club Golf Shop and ensured that member's expectations will be met. Provides a unique and exclusive shopping experience by planning and organizing trunk shows, custom tailoring, wardrobe selection, premiere line showings and corporate sales. Displays merchandise in an attractively and esthetically pleasing manner to maximize interest from the members to increase sales. Maintains sufficient stock levels. Places special orders for members and guests. Sets up, maintains & troubleshoots Golf Shop and Tennis Shop Point of Sale system as necessary. Controls inventory for all hard and soft goods and organizes, manages & supervises physical inventories with assistance from staff. Processes month-end reports for the Head Golf Professional and accounting. Receives stock merchandise, special orders into inventory, maintains a receiving log and secures immediately. Processes all merchandise using POS system including checking packing slips, hanging, folding, and steaming clothing. Processes all invoices for payment and submits to accounting and records invoices. Populates Open to Buy plan with EOM information for sales, cos, and inventory levels. Ensures stockrooms are kept organized so that items are easy to locate. Analyze sales and trends to determine additional needed sales promotions, markdowns, and clearance sales. Attend approved merchandise buying shows and conferences within the limits of the budget. Assists Golf shop staff with all special events. Welcome members and their guests to the shop. Maintains the golf shop merchandise in an organized fashion and maintains daily cleanliness. Daily operations include answering phones and assisting members with selecting and purchasing merchandise. Requires excellent customer service skills. Excellent communication skills, both verbal and written. Must be willing and able to work 40+ hour work week, including weekdays, weekends and holidays. Have at least one year of retail sales and/or golf shop experience. A friendly, outgoing personality and the ability to make others feel welcome is essential. A clean cut, professional image is required. This position is an ideal fit for someone who has an interest in the retail industry and/or pursing becoming a PGA member. Basic computer skills, ability to analyze data and prepare reports. Requires good mathematical skills. Previous use of POS software is preferred. Requires knowledge of inventory management and controls. Must have knowledge of statistical information to insure proper stock mix and turnover ratios. Must be able to lift 35 lbs. An Associate's degree (A.S) plus two years to four years related experience and/or training; or equivalent combination of education and experience. Merchandiser reports to Head Golf Professional. Works closely with the CFO. Salary is competitive and commensurate with experience. Incentive plan offered. Benefits are available to full-time employees after a waiting period and include: Medical, Dental, Vision, Short Term and Long Term Disability, 401(k), Life Insurance, and Vacation Pay. Resumes and cover letters accepted via e-mail only. No telephone calls, please. Have you been told you have an outgoing contagious personality? Do you thrive when in a role the success and failure depend on you? Are you always looking for new trends? Do you enjoy collaborating and working with a team? Congressional Country Club, located in Bethesda Maryland has hosted four Major Championships and is the site for 8 future Major Championship events including the 2022 Women's PGA Championship, 2025 Senior PGA Championship, 2031 PGA Championship, and the 2036 Ryder Cup. The Club has 36 holes of championship golf; our Blue Course is ranked among the Top 100 in the U.S. The Blue and Gold course are ranked #1 and #4 in the state of Maryland respectfully. PGA Director of Athletics Jason Epstein was the PGA's 2015 National Merchandiser of the Year for Private Clubs. Congressional is an AGM Platinum Award Winner including "Best of the Best Top 10" Golf Shops in years 2017 and 2018. Congressional Country Club is looking for Team Members that believe the impossible is possible. Driven to continuously make a positive impact on the organization and believe that as a team we accomplish more. The Assistant Director of Retail selected must have strong organizational skills and a passion for high-end private country club/resort experience. Congressional is open year-round and hosts in excess of 50,000 rounds annually. Manage the special-order process ensuring order accuracy, on time delivery and handling any returns. Provide consistent, timely and effective communication with members throughout the special-order process. Works with Director of Retail on "Open to Buy" and buying strategies. Ensuring our retail displays are truly 'the best of the best' throughout the shop. Conducting quarterly inventories, ensuring strict adherence to inventory policies and procedures. Developing a working knowledge of hard goods. Assisting the hard goods manager as needed. Assisting at "the counter" throughout the day to maximize the member experience. East Lake Golf Club located in Atlanta, Georgia, is the home course of legendary golfer Bobby Jones and is the oldest golf course in the city of Atlanta. The Club is not only historic, but philanthropic as well. Proceeds from operations - more than $20 million to date - support the East Lake Foundation, which has helped transform one of the nation's worst public housing projects into a thriving community. Since 2005, East Lake has been the permanent home of the TOUR Championship, the culminating event of the PGA TOUR Playoffs for the FedEx Cup, with only the top 30 players on the points list qualifying each year. Summary of Position: This position will work directly with the Head Golf Professional and Retail Manager to support the daily operation of the golf shop. These responsibilities include but are not limited to opening and closing duties, managing and maintaining an accurate tee sheet, communicating with other departments, creating visually appealing merchandise displays, and provide world class customer service to members and their guests. Assist in the buying of merchandise for the golf shop. Receiving, pricing, and presentation of merchandise. Answering phone calls and emails in the golf shop. Operation of the Point of Sale system and inventory control software. Be active on the golf shop floor to assist members and guests. Manage and improve inventory control procedures. Maintain and cultivate relationships with multiple vendors. Assist in other duties as needed for the entire golf operation. Familiarity with TAI software is a bonus. Hourly rate based on experience. Resumes accepted via email only. Please no phone calls. PGA Golf Club is seeking a Merchandise Manager, responsible for overseeing all on-site management, sales, customer service, visual displays, buying, receiving, pricing functions, and inventory management functions related to merchandising at PGA's Golf Properties. This individual must represent the PGA of America in the upmost professional manner. Work directly with the Head Golf Professional to develop the annual Merchandise Open to Buy plan, implement in accordance with that plan while monitoring pricing and cost of goods sold to meet budget goals for the operation. Conduct quarterly reviews of Open to Buy Plan and Club's Merchandise Budget to maintain acceptable inventory levels ensuring profitability through inventory turnover. Maintain ordering, receiving, and storage SOP's as established by PGA Golf Properties. Administer monthly and quarterly physical inventories to properly manage shrink controls utilizing Return to Vendor and Damage & Unsellable SOP's as prescribed by PGA Golf Properties. Design and implement customized sales promotions and/or programs with the Golf Shop staff to enhance customer participation and increase retail sales. Hire and train all merchandise operations employees (final approval from Head Professional required) utilizing standard company procedures. Conduct and complete annual performance reviews for the merchandise team and develop employee self-improvement programs and recommend changes in salary. Design and create merchandise displays based on PGA Golf Properties AGM Platinum award winning standards of excellence. Project a positive favorable image for the Club and PGA Golf Properties with the Club members, PGA professionals, guests, and representatives from merchandise manufacturers. Establish and maintain responsibility for the cleanliness and appearance of the Golf Shop. Work closely with the head golf professional, golf professionals, and staff to determine demographic make-up of various clienteles and purchasing patterns so as to target market segments and use this information to develop focused merchandise product mix plans to maximize sales. Ensure monthly department overview, variance report, and forecast spreadsheets from the month end reports are accurately prepared and forwarded to the Head Professional based on provided timelines. Review and analyze various financial results/reports while monitoring the overall Merchandise department's performance and take any corrective actions that may be needed. Manage assignments according to the annual financial budget and work towards meeting these goals throughout the year submitting/utilizing proper forecasting, cost controls, labor management, reporting, and revenue generation. Bachelor's Degree (B.A.) from an accredited college or university or equivalent preferred. Thorough knowledge of retail store management. Background in and knowledge of visual display, merchandising, sales and golf products. Experience in golf shop and/or retail merchandising, buying and analysis. Computer literacy and understanding of the changing dynamics of information systems. Familiarity with marketing research and business planning and the ability to analyze and interpret research. Ability to read, analyze, and interpret general business periodicals, professional journals, technical procedures, or governmental regulations. Ability to apply concepts such as fractions, percentages, and ratios to practical situations. Ability to interpret a variety of instructions furnished in written, oral, diagram, or schedule form. Works harmoniously with others to get a job done, responds positively to instructions and procedures and is able to work well with staff while maintaining relationships, which breed productive disagreement and debate. Meets the expectations and requirements of internal and external customers. Gets first hand customer information and uses it for improvements in products and services. Acts with the customer in mind and establishes and maintains effective relationships with customers and gains their trust and respect. Founded in 1936, Southern Hills Country Club is a private, member-owned country club located in Tulsa, Oklahoma is actively seeking an experienced Merchandiser for its award-winning retail shop. Southern Hills Country Club is best known for its golf courses, which are recognized among the top 100 courses in the world and have been the host to 15 Major Championships since 1946. Summary of the Position: The successful candidate will assist the Director of Golf with the management of the daily golf operation including, but not limited to; managing the total merchandising operation for the golf shop, assisting in managing and tracking play, protecting and controlling assets, communicating with the outside service staff and providing other professional services to the membership to ensure an exceptional experience. Purchasing, receiving, pricing, visual presentation, promoting and selling of merchandise, and controlling inventory levels. Assisting with in preparing operational budgets for the merchandising. Assisting the Director of Golf with developing and executing seasonal merchandise plans, visual presentation guidelines, pricing strategies and organizing accounts payable. Marketing merchandise by studying advertising, sales promotion and display plans. Being visible in the golf shop and assisting customers with any needs they might have. Developing and managing the annual buying plans for the golf shop. Maintaining effective work relationships with local and internal sales representatives. Developing effective strategies to ensure and measure member satisfaction with the merchandising function. Providing continuous training to the golf staff with the Point-of-Sale and inventory control system. Attending local, regional and national merchandise shows. Attending continuing education seminars to stay in line with current trends. Assisting in management of the daily golf shop operation, including operating and managing the main counter, processing all related golf charges, answering phones and assigning tee times. Assisting the WGA & Couples Golf Associations with planning and execution of events. Assisting the golf professionals with all tournament operations. Enforcing and administering any club rules and golf etiquette. Being informed on and promoting all club activities and services. Conducting oneself in a professional manner and maintaining a professional image at all times. Serving as the representative of the Club as instructed by the Director of Golf. Monitor Procedures for merchandise flow: receiving, checking in, charging, etc. Resumes accepted via e-mail only. No telephone calls, please! The Villages, an active adult community replete with lifestyle activities, is currently seeing a Retail Associate. The scope of the position requires the ability to work in a multi team environment. Abide by all safety policies and procedures. Excellent computer skills including Microsoft Word, Outlook, Excel, and POS system. No formal supervisory responsibilities in this position. May provide informal assistance such as technical guidance and/or portfolio specific training to co-workers. English is required for oral and written communications. Olympia Fields Country Club is a 36 Hole, private country club located 30 minutes southwest of the Loop in downtown Chicago. The club is internationally famous for hosting numerous Major Championships and has been listed in Golf Digest's Top 100 courses every year since 1965. The Golf Shop is owned and operated by 2009 PGA of America Merchandiser of the Year Brian Morrison. The golf shop has been recognized as a top 25 private club golf shop 16 years in a row. The club hosts 30,000 rounds a season, and has approximately 600 members. Have a sunny disposition and create a welcoming atmosphere in the golf shop to members and guests. Present an attractive array of men's and women's apparel, accessories and golf related merchandise that is consistent and in line with membership expectations. Build displays and maintain golf shop in a clean and orderly fashion. Have necessary computer skills to send communications to membership with photos and promotions of merchandise in golf shop. Develop strategies to enhance sales and customer satisfaction. Maintain and execute a healthy special order business within golf shop. Be willing to answer phone and if necessary book tee times or lessons. Maintain appropriate inventory levels on a seasonal basis. Conduct Trunk Shows and other promotions to enhance sales. Keep accurate records of all orders be it special orders or seasonal inventory orders. Meet with Sales reps to plan for next season's inventories. Must be able to stand for long periods of time, lift object above head, handle objects weighing more than 20 pounds, walk, kneel, squat, hear and speak clearly. This is a 9 month seasonal job with a flexible schedule, but candidates are expected to work 5 days a week with up to 50 hours during tournament weeks. Remuneration is commensurate with experience. Hammock Dunes Club,an Emerald award winning 36-hole private facility in Palm Coast Florida., is seeking Merchandiser. The golf facilities at the club consist of the ocean front Links Course designed by Tom Fazio and the Rees Jones designed Creek Course on 690 acres of wildlife preserve. The two courses are about 5 miles apart and each has its own clubhouse and golf shop. Assist Director of Golf in establishing retail goals and policies of the Hammock Dunes golf operation. Responsible for the direction of the overall retail efforts to create the proper merchandise mix, maximize sales, turn inventory, minimize shrink, and create a platinum level presentation. Helps to facilitate teamwork, motivate staff and promote a positive staff environment. Creates high morale among the golf staff. Creates a superior service environment. Works with the Head Golf Professional to develop scheduling of golf operation personnel. In collaboration with the Director of Golf, develops buying programs through selected vendors. Determines Open-to-Buy. Plans and promotes merchandise and event marketing. Promotes daily floor sales and customer relations. Provides merchandise display maintenance and trains staff in effective visual merchandise presentation. In collaboration with the Director of Golf, determines yearly merchandise budget and merchandising strategies. Provides monthly variances to supervisor. Establishes stock levels and controls. Monitors Special Order and Return to Vendor procedures. Coordinates physical inventories with golf staff and Hammock Dunes controller. Evaluates monthly stock levels and initiates markdowns. Controls COGS via proper paperwork flow and buying plan. In conjunction with the Director of Golf recruits staff and trains part-time staff personnel. Establishes review system of part time personnel at 90 days (new employees) and assists in conduct of annual personnel reviews. Implements training program to increase staff knowledge and productivity. Establishes procedures for merchandise flow (receiving, check-in, ticketing, and returns). Creates continual improvement in visual merchandise presentation. Bachelor's degree preferred. Has had experience in a private club merchandising and buying environment. Previous experience with Jonas Point of Sale system preferred. Resumes and cover letters accepted via email. No telephone calls please. Cherry Valley Club a private, 18-hole facility established in 1916, is seeking a Golf Shop Manager who will report directly to the General Manager and supervise shop staff. Assures policy, procedures and Club rules of the pro shop are enforced. Prepares the employee work schedule ensuring that the pro shop is properly staffed to handle the customer volume. When necessary, resolve customer complaints to customer's satisfaction in a timely manner. Arrange displays to maintain impeccable appearance; restock golf shop daily and keep golf shop organized and clean. In conjunction with the clubs Chief Financial Officer and General Manager, establish pricing policies and implement within the pro shop. Establish and monitor the product displays in the pro shop. Buying, receiving and merchandising of all golf merchandise. Assist in packing and unpacking inventory. As appropriate, conduct sales of slow moving inventory within the pro shop including end of year sales to reduce inventory levels during the off-season. Maintain strong inventory and purchasing control policies and procedures within the pro shop. With the General Manager and other key employees, develop plans to accomplish long and short-term goals for the pro shop. Work with accounting personnel to establish inventory goals and procedures, ensures that all record keeping and POS procedures are in compliance with the club's requirement. Professionally answer phone calls, book lessons and respond quickly to all members requests. Recruit members for tournament participation. Maintain a flexible schedule with the willingness to work a combination of weekdays and weekends. Manchester Country Club, a private 18-hole Donald Ross designed course built in 1923, is seeking an experienced Merchandise Manager. The club, located just outside Manchester, New Hampshire, is rich in history and proudly managed by Troon. The Merchandise Manager ensures merchandising priorities, strategies and tactics are aligned with the standards of Manchester Country Club and follow the established merchandise plan. Maintains effective stock levels and ensures stock presentations are appropriate for all seasons. Sells and maintains golf shop merchandise while providing member and guest service. Places special orders upon guest request. Works with Area Retail Manager on "open to buy" and buying strategies. Receives merchandise, prices merchandise, enters into POS system, and monitors inventory levels. Presents merchandise in attractive displays and rotate keeping a fresh look to golf shop. Works closely with the accounting office on accounts receivable and accounts payable issues. Ensures available discounts are utilized. Creates weekly displays showcasing new and unique products. Ensures replacement and return policies are adhered to. Ensures follow-up on past due orders and that canceled orders are communicated timely. Compiles and monitors daily sales forecasting reports. Education/Experience: Certificate from college, technical school or accredited facility; or three to six months related experience and/or training; or equivalent combination and experience. Physical Demands: Regularly stands, walks, reaches with hands and arms, talks or hears. Occasionally sits, climbs, balances, stoops, kneels, crawls or crouches. Frequently uses hands. Frequently lifts up to 25 pounds. Regularly lifts up to 50 pounds. Ability to read and speak English may be required in order to perform the duties of the job (e.g. the associates may be required to communicate with English speaking customers or co-workers, the manuals for the equipment the associates may use are in English). Previous experience with Jonas Point of Sale (POS) system preferred. The start date is flexible for the right candidate. Salary, commission, and uniform allowance based on experience. Cover letter and resume accepted only via e-mail. No telephone calls, please! The Apawamis Club, a private 18-hole facility located in Rye, NY, is seeking a full-time (March through December), experienced Merchandiser. Start/End dates and schedule can be flexible based on candidate. Establish/update procedures for Merchandise receipt, ticketing, display, sales, etc. Plan, Promote, coordinate, and market special events; Trunk Shows, Holiday Sales, etc. Resumes and cover letters accepted via e-mail only. No phone calls, please! Avon Oaks Country Club is Northeast Ohio's dynamic family-oriented country club. Our club is located on the West Side of Cleveland just into Lorain Country, very close to I-90. We are looking for a Golf Shop Manager to join our team. The Golf Shop Manager is responsible for managing the day to day operations of the golf shop. This includes purchasing, sales, displays and inventory management. The individual must demonstrate strong organizational and interpersonal skills as well as a proven background in the inventory purchasing and management process. Creating and executing buying plans based on sales history and sales goals. Maintain adequate inventory levels throughout the season. Manage quarterly and annual inventory process. Scheduling of golf shop staff. Managing the special order process. Assist in golf shop communication to membership. Assist in creating promotional materials for golf operation. Assist in the selection and distribution of tournament and tee gifts. Strong computer skills particularly Microsoft Word, Excel, and Publisher. Previous retail experience at a green grass operation preferred. Must be able to work a flexible schedule including weekends and holidays. If you would like to be considered for this position, send your resume by email. No telephone calls, please! The South Fork Country Club is seeking and outgoing professional to manage the day to day operations of the golf shop including purchasing, sales, inventory management, and visual merchandising for the 2019 summer season. The South Fork Country Club is located in Amagansett, New York. Our summer season, peak season, runs from Memorial Day weekend through mid-September. In the past few years our business has grown and we are looking for a qualified professional to take over this position. Possess an outgoing, friendly personality and professional "golf" appearance. Previous experience at working in a private club environment. Previous experience with computer point of sale, preferably Jonas Club Management. Experience is sales with an upscale clientele. Previous experience in a "Boutique Style" merchandising concept. Purchasing goods on the Club's behalf for the season. Visual display changes and overall shop management. Scheduling for shop assistants/interns to assist in golf shop. Inventory management control and order entry. Member customer service and golf shop sales. Custom ordering for club member needs. Meeting with vendors and attending the PGA Merchandise Show on the Club's behalf. Maintain a creative eye for merchandising and sales. Work closely with the staff in an "open to buy" program to benefit the Club. Maintain reports and special order books in an organized manner. Works closely with Head Golf Professional to purchase tee gifts/prizes for all golf events and golf association within the Club. Autonomy in purchasing, displays, and sales. Employment dates April 1 through November 30. South Fork will pay any PGA Education expenses during work season and allow time off with discretion and approval. Expenses paid in off season will be predicated on the employee committing to the next season of employment. Year-end bonus based on performance. Cover letter and resume accepted via email. No telephone calls, please! The Yellowstone Club, a private, 18-hole facility recording 15,000 rounds in a six month season, is paradise in Montana. A private residential community in Big Sky, Montana, Yellowstone Club offers its members the world's only private ski and golf community. With fabulous skiing & snowboarding and the most gorgeous spring and summer weather to enjoy the 18-hole golf course, rivers, hiking, biking, and much more, our Members love being a part of this exceptional community. We are seeking a Golf Retail Merchandiser for our Golf Operations department who must be a dynamic salesperson to take on the supervision of the Golf Retail Shop and all Golf Retail outlets. This opportunity is perfect for anyone looking for full-time work in the retail and sports industries. Candidates will also handle member and guest relations as far as purchasing both soft goods and hard goods, assisting in recommendations of selections, event registration, tee time scheduling, and more. The Golf Retail Merchandiser will work closely with the Director of Golf and Head Golf Professional to ensure a world class merchandise operation, as well as acting as an overall golf operation supervisor, at the Yellowstone Club. The position offered is a full-time, year-round position located in Big Sky, Montana. The Yellowstone Club offers great benefits including medical, dental, vision, a 401-K program with company match, a free ski pass, free transportation from Bozeman to the Club upon hire, a complimentary meal each day, ski days each month for employees to enjoy the mountain, and outdoor activities to enjoy in the summer months. Plus, you get to work at one of the most incredible places on earth! For more information about the Club, visit www.yellowstoneclub.com. Resumes and cover letters accepted via e-mail only. No telephone calls, please! Sleepy Hollow CC, a private, 27-hole facility, in Briarcliff Manor, New York, is seeking a full-time (March through December), experienced Golf Shop Manager. Strive to provide a new and exciting look to the Pro Shop through merchandising and displays. Create an atmosphere that is inviting to both member and guest. Provide customer service through knowledge of clothing and equipment lines. Designing and creating new merchandise displays on a regular basis. Create color stories/theories for the Pro Shop displays. Maintain soft goods (apparel) inventory and re-order when needed. Provide the highest level of customer service on an ongoing basis in a professional and friendly manner. Maintain a clean, organized Pro Shop. Merchandising and display changes when needed. Assist with the general tidiness and ensure all clothing is neatly folded and displayed. Provide customer service to members and guests. Learn and understand the POS and tee time reservation system. All other duties that may be assigned from time to time. The start date for this position is March 2019. Resumes and cover letter accepted via e-mail only. No telephone calls, please! The Golf Club at Lansdowne located in Leesburg, Virginia is excited to announce the exceptional career opportunity of Golf Shop Retail Attendant. Qualified candidates will thrive in a hospitality environment and be highly-focused on providing superior service for our guests. The major focus of the position will be to assist in administering all daily operations including, but not limited to: facilitating sales, assisting with merchandise, operating POS system, acts as member/guest relations during golf shop shifts. Assists in administering all point of sales applications as it applies to green fee sales, merchandise sales, and member/guest billing. Reconciles daily tee sheets, performs check-in, and receives payments from members and guests. Resolves discrepancies as it applies to duplicate charges and over or under payment. Promotes all club golf activities. Maintains a clean, orderly, and well-stocked golf shop. Assists retail buyer with merchandising and sales promotions. Follows established opening and closing procedures. Incorporates safe work practices in job performance. Associate's degree (AA) or equivalent from two-year college or technical school; or six months to one year related experience and/or training; or equivalent combination of education and experience. Regularly stands, walks, sits; uses hands; reaches with hands and arms; talks and hears. Occasionally climbs or balances; stoops, kneels, crouches, or crawls; lifts up to 25 pounds. Regularly works in outdoor weather conditions. Noise level is moderate. Cullasaja Club, a private country club in Highlands, North Carolina, is looking for a full-time seasonal (May through October) Retail Merchandising Associate whose responsibilities will include handling all aspects of merchandising for the golf shop operations as well as tending to golf shop counter duties. Commensurate with experience - benefits include commission, year-end bonus, meals while on duty, playing privileges. Preferred acceptance of resumes and cover letters is via e-mail. Tory Sport - Performance activewear by Tory Burch. Inspired by the grace and strength of athletes, Tory Sport is designed to reflect the beauty of the game and the empowering role that sports play in all aspects of a woman's life. A modern take on iconic Seventies activewear, Tory Sport products are engineered using the most innovative textile technologies. Classic styles are revamped in fresh colors, graphic prints and performance fabrics that don't look or feel overly technical. Tory Burch is an American lifestyle brand available in more than 50 countries worldwide, and include products ranging from shoes, clothing, and accessories from home and beauty. Overview: As a Tory Sport - Green Grass - Sales Representative you are responsible for delivering premium customer relationships to targeted premium private clubs, resorts, and hospitality shops within your assigned sales region, building our brand one customer at a time and ultimately driving our business by developing strategic sales plans to achieve seasonal sales goals and objectives. This role's primary responsibility is sales, but will also focus on building long-term customer relationships, elevating brand awareness, facilitating retail excellence, hosting customer events, and contributing to the overall success of the Tory Sport brand. Sales Representatives demonstrate exceptional selling skills and a strong commitment to sharing the Tory Sport brand throughout their assigned territory. Quality customer engagement, professional consultation, and a strong sense of fashion & style are critical attributes for success in this role. Achieve seasonal sales goals and objectives. Develop and maintain meaningful long-term customer relationships. A complete list of responsibilities and qualifications for this role visit can be found in the careers area of the www.toryburch.com website. Resumes accepted via e-mail only. Eyeking-Exclusive licensee of Under Armour Eyewear is seeking motivated, well-connected and established Golf Sales professionals to call on green grass, off-course, and resort channels. This is an exciting position in a fun and easy to present category that offers growth potential both in shop distribution and event/tournament business. QUALIFICATIONS: Experience required- If you have the passion and the time… you will succeed representing the hottest brand in golf eyewear. Compensation: Excellent sales and commission program for professionals who want to be part of the incredible growth of the Under Armour Brand. Abacus Sportswear, a pioneer of high-performance stretch waterproof fabrics, produces smart, technical clothing which combines Swedish design with quality and functionality, befitting the active golfer. Golf should be purely about the game, with no impediments or distractions - and is why Abacus Sportswear's clothes are designed to work and move in total sync with golfers, providing complete Freedom of Motion which, in turn, provides Freedom of Golf. Abacus Sportswear's brand ethos encapsulated its Swedish roots, combining quality and function to produce smart, technical clothing for the active golfer. The mission is to do functional and smart clothing for the active golfer. Today, abacus® is available in over 35 countries, with strong market positions in Sweden, Denmark, Holland, Germany, and a growing presence in Asia-Pacific. Official supplier of the European Tour, The European Solheim Cup Team, The Asian Tour, The Challenge Tour and Official Licensee of the Ryder Cup. Black Clover is a lifestyle apparel company with a vision rooted in living life to the fullest. We simply call it "Live Lucky." Every premium Hat, Hoodie, T-Shirt, Beanie, & Belt accessory is designed to inspire and invite its owner to enjoy life, to embrace every day, to Live Lucky! Established in 2008, Black Clover offers lifestyle clothing and accessories for men, women and children who want the most out of life and demand the same from their clothing and gear. Quality is not an accident, it's a choice and we at Black Clover choose to be the very best at what we do. We choose to Live Lucky. Experience the thrill and join Clover Nation today. Represent Black Clover with a professional demeanor and attention to detail. Nivo brand is distributed in the U.S. and Australia by Lanctot, a 40 year old Canadian firm specialized in designing and distributing brand name clothing. The company is currently seeking territory account managers to call on established accounts as well as new business development. Ideal candidate has experience in the green grass market with existing knowledge of account base. 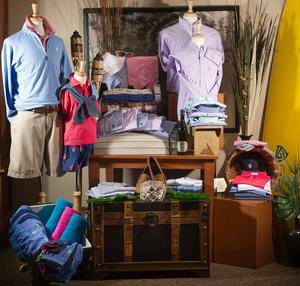 Understand how to show apparel and strategize with buyer best product mix for their golf shop. Understand how to handle objections and find solutions. You enjoy what you do and display a winning attitude to grow the business. Basic computer knowledge and capable of filling out electronic order tool. This is a commission based position with the option to earn a bonus on new accounts and territory growth. We are open to candidates who may not be able to represent both Nivo and Sligo as a combined territory. Please contact Dawn Hulett by phone 727.612.8558 or e-mail if interested. Town Talk Headwear is searching for independent and enthusiastic road reps, from all over the nation, to join our team! Town Talk opened its doors in 1919 with five employees and a desire to manufacture the highest quality headwear in America. Through the years, we have produced Little League baseball caps, military fatigue caps, chauffeur baseball caps, painters caps, and today's extensive golf collection without wavering from our original "highest quality" commitment. We are proud that throughout America the Town Talk name means the best in headwear. Town Talk Headwear has been famous in the golf industry for 60+ years, supplying the highest quality headwear. We are looking for competitive sales representatives to develop sales strategies and attract new clients. You will source new sales opportunities and close sales. The successful candidate will play a key role in increasing income and revenue by managing and negotiating with clients, generating leads and qualifying prospects. COMPENSATION based with different programs to help you reach your goals! MOVETES is a Fashion-Sporting Lifestyle and Golf style apparel brand designed to meet the needs of today's active woman, blending classic tailoring with function, fitness, and fresh options that take her from one game to the next. A curated capsule of excellent fabrication and quality defines the Collection that is gaining momentum in top clubs across the country. Garb Inc., a leader in children's golf apparel across the US, the Caribbean and Europe, we are looking for a New England Sales Rep to find new sales opportunities and service existing account relationships. This Independent Rep is responsible for all sales activities from lead generation, to writing sales orders and maintaining account relationship for continued growth across New England. Work with Director of Sales to ensure best business practices for growth and continued customer loyalty. Report directly to Director of Sales. Competitive commission program and sample programs. Resumes and cover letters accepted via e-mail only. JBA Awards, supplier of unusual sculptures, etched crystal, pewter, gifts, clocks and unique tee prizes including travel bags, shoe and valuable bags is seeking experienced sales representatives in several territories to sell tournament prizes to green grass clubs & tournament groups. To introduce, grow and solidify an athletica apparel brand into the golf industry, featuring a newfangled classic style, unparalleled fabrics, and most importantly comfort. Whether you're wearing Anderson Ord products on the street, at the beach or on the links, you'll always know the "looking good" and "feeling good" part of the equation has already been taken care of. Introduce/ Increase wholesale accounts by acquiring: green grass pro-shops through face-to-face sales tactics. This position reports to the Sales Director. Primary focus will be to engage with potential new accounts by calling on golf shops & country clubs and scheduling face-to-face meetings. Attend the most important trade shows in the industry in various regions of the United States to acquire new accounts. Report customer and account feedback to the Sales Director to help meet customer demands and wants. PRG Americas, a fast growing golf accessory business that works with golf courses throughout the US, Mexico and the Caribbean, is looking for an Account Manager who will assist our outside sales reps and clients with sales, processing and shipping orders. In addition, the ability to cold call for new business and work with some of the most elite facilities in the country is a must. Experience in the golf industry is good, but not a requirement. Knowledge of the game of golf is very beneficial. If you have experience with online (direct to consumer) and working with Amazon, that would be of great value, but not required. We need someone with a strong work ethic, great personality and the ability to be a team player. Computer experience is necessary and the ability to wear multiple hats and help with managing inventory, preparing product for shipment, etc. is required. The successful candidate will have great customer service experience (think Nordstrom's, Ritz Carlton, etc) and be a self-starter. They will need to have the ability to sell, help our sales reps and customers with creating great looking product designs, support 100's of customers, have strong communication and organization skills. This job will encompass several facets of the business, but the successful person will be in a position to grow and gain experience. Normal hours will be 40 hours per week during normal business hours, but from time to time could involve some overtime and occasional Saturdays. Some limited travel will be involved. This is a full-time hourly position ($15.00 to $19.00 per hour) with a competitive wage along with quarterly and annual bonus potential. Other benefits are available and will be explained further upon an interview. Interested and qualified individuals should submit a resume and cover letter via e-mail or fax - no telephone calls, please. The NEW Sport Haley / Bette & Court / Slim-Sation Golf has recently been acquired by Sharon Young, Inc., a better women's sportswear company. Sport Haley has been a leader in the golf industry for over 29 years and with the acquisition we are poised for accelerated growth with our brands, Sport Haley and Bette & Court and now Slim-Sation Golf. Sharon Young has a history of bringing great product to the market and delivering it on time and the customer service department is one of the best in the industry. Sport Haley focuses on lifestyle apparel that is timeless, traditional and designed with a modern flair and a twist of golf inspiration. We are a grass roots organization that stays true to our customers and we drive our brands by understanding the needs of our customers and the desire for great pieces on and off the golf course. We have the finest design team in the industry. Product is designed for the woman golfer, but can just as easily be worn as better sportswear. Bette & Court is our active performance brand led by our Original Sun Protection. We create smaller collections around our core performers to enhance the fashion in today's market. Several of our reps have been with the company for over 15 Years. Slim-Sation Golf is a fantastic ladies pull-on bottom in 5 styles: Short, Skort, Capri, Ankle Pant and Full Length Pant. This is truly a unique opportunity to join a new, but well-established company. Job Responsibilities: This is an independent sales representative position. In this increasing competitive market, we are seeking an exceptional sales representative that is creative in the way they go about their business. We are looking for a brand ambassador that will help grow our distribution. You must be willing to travel extensively to visit all potential accounts in the territory. You must enjoy working with buyers and golf professionals to help them grow their business. You may carry non-conflicting lines. You will have a marketing budget and you are expected to maximize the opportunities. Qualifications: It would be helpful to have established relationships in the territory. Compensation: Sales representative will be paid a commission on all sales with good bonus opportunities. To learn more about Sport Haley, visit our website at: www.sporthaley.com . If you feel you can add value to our team, we want to hear from you. Please send your resume with a cover letter that tells us how you feel you can best maximize opportunities within the territory. Please send all resumes via e-mail. Katherine Way Collections, one of the fastest growing women's brands and winner of the PGA Top Buyers Choice Award, is actively searching for several golf Sales Reps to start immediately for the Spring 2019/Fall 2019 seasons as we expand into new territories! Katherine Way has created an apparel line of dresses and golf attire. Proudly made in the USA, our fabric is a special nylon/spandex blend fabric that is moisture-wicking, machine washable and wrinkle-resistant for easy care and wear with a UPF 50+ rating. We are currently in over 350 boutiques, golf clubs and resorts mainly in the Northeast and Southeast. We exhibit each year at the PGA Merchandise Show in Orlando, FL and the PGA Fashion and Demo Experience in Las Vegas, along with multiple regional shows. In 2016, we were awarded the 2016 Top Buyers Choice Award at the PGA Fashion and Demo Experience. YOU can be a part of our growing team! We are looking for responsible individuals in Arizona, Northern California, Southern California, North and South Carolina, Georgia, Michigan, Wisconsin, Ohio, Maine, Vermont, New York, Connecticut, Massachusetts, Pennsylvania, Maryland, Virginia, West Virginia, Kentucky and Tennessee. Compensation: This is a 1099 Independent Sales Position. Commission only. QED Style is a premium golf and lifestyle apparel. We are looking for an individual to help us take this company to the next level; specifically, an individual who understands the importance of building relationships, passionate about life and knowledgeable about apparel and willing to travel. Jofit is looking for super passionate, ambitious, and motivated Independent Sales Representatives to join our outside sales team. Our extensive line of athletic wear made for women by women is designed to fit and flatter regardless of size, activity, or age. Launched in 2006 by Founder & CEO, Joanne Cloak, a.k.a "Jo. ", Jofit is fashion-forward golf, tennis, and lifestyle apparel. At Jofit we always have time to have a little fun, but we're also great at what we do. We're on the lookout for bright, magnetic and determined people to help us make our customers smile. We hire passionate, entrepreneurial, smart individuals who thrive with a team atmosphere. As a Jofit Sales Rep you are professionally aggressive, action driven, and goal oriented to growing new business. You are an enthusiastic brand ambassador with a charismatic and ambitious personality and an eye for style. We are looking for people with an "out of the box" mentality. Do you enjoy sparking up a conversation with a complete stranger? How about reaching out to a friend that you haven't met yet? If that's you, we would love to hear from you. The combined Callaway Soft Goods Licensees are seeking sales professionals in select territories to join our team representing one of the most dynamic brands in Golf. This is a unique opportunity that combines 3 manufacturers - allowing greater income opportunity. Callaway Apparel is an industry leader in apparel that is truly authentic to golf. Our fit, performance, and style not only enhance performance on the course but, have a sophisticated and timeless look off the course. We offer some of the highest commission rates in the industry. Callaway Footwear is re-launching from a manufacturer with over 50 years experience in performance athletic footwear. They have a proven track record in fit, performance and comfort and now are providing contemporary classic golf footwear. Callaway TAG has recently introduced a new line of Eyewear providing the visual performance and protection you would expect but designed to maximize ability to effectively read greens. They also have a full line of Callaway Branded DMD's and Accessories. We provide some of the highest commission rates in the industry. As we are always interested in building our rep base, if you reside in other parts of the country and find this position of interest, we would like to review your cover letter and resume detailing your sales experience to date. Glenayr Golf, formerly Canterbury Belts, is a quality collection of men's & women's belts, including assorted custom logo accessories, manufactured in Canada. Orders "Canadian Made Product", destined for the US are duty free, as per the USMC agreement and are shipped FOB, Buffalo, New York. We currently require Professional Sales Agents, for the US golf market. Compensation is commissioned based. 15% Initial New orders and 12% payable on all repeat orders. Mayva K Collection was founded in 2011. We produce and distribute high quality accessories for women in both the golf and tennis markets. What sets us apart from our competition is high quality, great price points and no minimums. Our products are both fashionable and functional for sport, travel or leisure. This provides our customers with a greater opportunity for add-on sales and an improved shopping experience for the consumer. We are looking for quality reps with established lines to deliver the type of service that meets and exceeds the expectations of our extensive customer base. If you think you have what it takes, we would love to speak with you more about this exciting opportunity. Achieve sales targets by servicing and growing existing customers as well as opening new doors. Experience selling women's golf and or tennis accessories. Existing customer base with in the golf or tennis industry. Ability to build and develop new and existing relationships. Excellent interpersonal and organizational skills. Territory management, planning and willing to travel extensively throughout territory. Represent Mayva K with a professional demeanor and attention to detail. MAKE TODAY LUCKY - Oxford designs clothing for men who expect only the best in quality and value. A rich passion for tradition runs through every thread, stitching together a legacy of performance from the golf course to the boardroom. Our innovative clothes equip you to take the reins and make your own luck - in business and in life. Oxford designs the clothes that make the man. We invite you to make today lucky! Resumes accepted by mail and e-mail only. No telephone calls, please! Jamie Sadock Resortwear, Sunsense Sun Protection Category, J Men's is seeking Independent Sales Representatives to call on Golf Shops, Tennis Shops, Country Clubs, Resort Shops and ready to Wear clients. Jamie Sadock Resortwear caters to women and Sunsense caters mostly to women but men as well. J Men's caters to men including tops and bottoms. Collections are offered twice yearly. Kinona Golf and Life is looking a for self-motivated, enthusiastic and ambitious Independent Sales Representatives to join our outside/inside sales team. Our founders, Tami Fuji and Dianne Jeffries Celuch, both had extensive careers in the fashion industry...from Juicy Couture, Speedo and Ann Taylor to Eddie Bauer. They have done an amazing job of creating beautiful women's clothing made from the finest Italian fabric. Our products are rated UPF 50 and we add designer yet sporty touches for the golfer that wants superior comfort and high-end fashion. So comfortable, stylish and versatile - it fits a variety of body types, so it's for ALL women. From Greetings and meetings to greens and grocery! Wholesale accounts - call on wholesale accounts that align with KINONA's desire for placement in premium golf clubs and wholesale accounts. Generate sales lead, develop relationships with buyer/pro/women's groups to help either sell in the collection to their pro shop or to schedule trunk shows/fashion shows/demo days. Be on point for setting up, selling and generating orders from these events. Ongoing communication with Wholesale Sales Lead on account status, order expectations, etc. Conduct regular check in on wholesale accounts to ensure sell through and develop relationships. Provide detailed downloads of new accounts and prospects. Generate sales leads in specific regions as directed by Wholesale Sales Lead. Research contact names, email, phone numbers and assess proper fit with KINONA target consumer. Working with Wholesale Sales Lead and other Wholesale Sales teams, set up appointments and actively communicate customer profile, address, time and any additional pertinent information needed to set up appointment. If requested, send line sheets, look book in advance of appointment. Develop strong product knowledge and communicate the philosophy of Kinona to customers. Devereux Proper Threads, an upper-end, casual resort golf lifestyle brand and one of the hottest new brands in the industry, is searching for qualified sales professionals in select territories to join our team and become a part of our exciting brand. Sales Professionals must have prior apparel sales experience, established territory relationships with accounts, and understand the importance of providing exceptional service to their accounts. The Devereux Collection is distinct in styling and doesn't conflict with most brands so it provides an exceptional additional to any portfolio. An aggressive commission structure is offered. Our job is to provide better-looking & better-fitting golf clothing and performance wear to the sports world. We want our customers to take on all activities of life while feeling comfortable and looking good. Increase Scout Sports wholesale accounts by acquiring pro-shops through face-to-face sales tactics. This position reports to the President of Scout Sports. Primary focus will be to engage with potential new accounts by calling on golf shops & country clubs and scheduling face to face meetings. Report customer and account feedback to the Design team to help continually meet the customers' demands and wants. We are open to part-time or full-time reps. Send your resume and let's talk! Since 1991 Vantage has been a major player in the golf market, providing many of the country's leading pro-shops with much more than just another apparel collection. The industry's leading source for event business, basic programs and staff uniforms. Vantage currently provides unique apparel opportunities for more than 1,500 top pro-shop accounts and our products are worn at major golf tournaments and events nationwide. Private label and custom apparel programs let customers create unique product and branding. We offer commissions up to 15%. Only candidates with a proven track record in green grass sales will be considered. Vantage Apparel has state of the art, in-house decoration capabilities (largest in the nation), collegiate licenses and the quickest lead times in the industry. Please visit our website at www.vantage77.com or browse through our catalog at www.zoomcatalog.com/catalogs/vantage-apparel-golf-2018#/1/ to learn more about Vantage Apparel. Birdies and Bows, one of the fastest growing women's golf and resort wear lines, is actively searching for Sales Reps to start immediately selling Spring/Early Summer 2019. In our little seaside town of Stuart, Florida, we are all about the sun, sand and fun. Offering playful printed UPF 50+ sun protective women's dresses, tops and skorts. Perfect for your always-active, water-seeking, tennis ball serving, golf club swinging lifestyle. All For Color is a line of UPF 50+ color/pattern driven ladies dresses, tops, skorts and and accessories for the Golf, Tennis & Resort lifestyle markets. SolChill by All For Color is our newest sub-brand of ladies UPF50+ tops that offer all of the performance features that today's Golf, Tennis & Resort lifestyle markets looks for. Resumes will be accepted via e-mail. Visit our website at www.allforcolor.com to find out more about our line. 2-DG Apparel is a new men's and women's apparel brand with a mission to help the environment, protect your skin and to help fund what will be THE universal CURE for cancer! 2-DG Apparel is made from beautiful artisanal fabrics in Italy, is 100% recycled fabric from abandoned fishnets in the sea and is UPF 50+. 2-DG is a lifestyle brand with an incredible feel and fit! This is an independent sales rep opportunity that is commission-based. Several territories open. Thank you for visiting the AGM Job Opportunities listings. Good luck!